I hate New Year’s Resolutions. I always give myself completely unrealistic goals and then feel like crap when I don’t achieve them. So this year I thought I’d have a little conversation with my children (in my head) about the resolutions they should put in place. Mostly in order to ensure I retain my sanity. I love my children. Adore them in fact, wouldn’t be without ’em. I can say in all honesty I would step in front of a bus if it meant saving their lives. But, man, they drive me crazy-nuts sometimes. In my post about being angry, I wrote about the trials and tribulations of coping with a baby and a toddler. 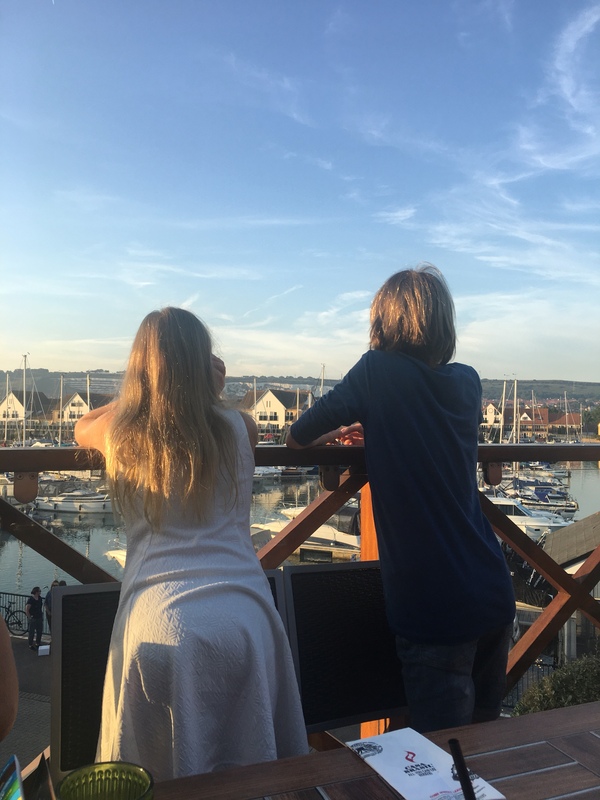 They were tough times; now my children are 12 and 9 they are much easier to handle – they don’t poo in awkward places anymore, and they don’t try and kill themselves by playing with knives, plug sockets and falling down steep slopes – but they continue to have an unerring ability to hit me where it hurts. My responses to their little quirks can range from hilarity, to stressy anger, to shouting, to utter despair. It would be wonderful if they could heed these suggestions. Maybe then I will get them to suggest some resolutions to help me be a better parent. By the way, I am aware a number of these issues have stemmed from being a crap parent when my children were younger (and now – it’s not like I’ve improved over time) Rob and I both work and my current job means I work seven days a week during term time. I am not around as much as I would like. This is something my children are very good at using against me. My son, then 10, once said to my husband: ‘I wish you could earn more so Mummy didn’t have to work so much.’ Ouch! Double whammy. Amazing how he managed to crush Rob as a man and me as a parent in one careless aside. So with this in mind, dear children, here are some actions you can take to ensure you don’t drive your parents towards a complete breakdown. 1: Don’t guilt trip your Mum and Dad. I know this is something you have both learned to do with admirably deftness as you have grown, but it’s not big and its not clever. We already feel guilty enough. In fact I suffer a constant sense of guilt about how crap I am as a parent. My children do this often: ‘you only won’t do it because you’re so lazy!’ or ‘Why won’t you buy me that (insert insanely expensive product here)? ALL my friends have one, you just want everyone at school to think I’m a LOSER’, or ‘Everyone else’s Dads play football with them ALL THE TIME!’ Statements guaranteed to weigh shoulders down with even more guilt. 2. KEEP YOUR ROOMS TIDY! Oh My God, my kids’ tidiness, or lack thereof, causes me more vein-busting fury then anything else in my life. In fact I’ve given up on their rooms now. They can bloody live in filth in there for all I care. They can roll around and rot in the banana skins, old cereal bowls and dirty laundry as far as I am concerned. At the moment, my battle is focused on getting their rubbish out of the sitting room. It’s hard enough keeping on top of that. People without children don’t have any idea how messy they can be. For example, look at these pictures. To be fair to my son, this was the absolute worse his room ever got and it was a while ago – he was about 7 – and his excuse was he was ‘looking for something’. There are three days between the before and after pictures. Three days of the following: Me, screaming, sweating and shouting whilst throwing rubbish in bin bags; carrying out six, SIX bin bags filled with crap; physical struggles over old broken toys which have suddenly become more precious than fricking diamonds; and finally, me videoing my son swearing solemnly never to leave his room in such a mess again. Look closely at the before photo – can you see my son’s leg beneath the rubble? Before – If you look closely can you see my son under the pile of rubble? The funny thing is now my son’s room is always immaculate. Without me saying a word, one day he just upped and cleared away all his old toys and put them in boxes to be stored in the loft. He asked for a desk and gaming chair for Christmas so now his room looks like the office of a YouTuber. My daughter continues to carry the torch, however, so it looks like I still have a few more years of prising dirty laundry out from under beds and bottom of cupboards. 3. Please recognise that when we limit your phone usage, or your time on the Playstation, it is not because we are joy-hating ogres, who delight in ruining the lives of young children. We are doing it so you a) don’t get groomed by sexual predators and b) don’t destroy your brains and eyes with the constant glare of wifi enabled devices. Ditto for making you eat food that doesn’t entirely consist of sugar. And yes that mango juice does contain 50 sugar cubes which will destroy your vital organs. No, crisps and cereal do not represent vital food groups and granola and Greek yoghurt are much yummier than coco pops. Yes I know I let you have coco pops yesterday, yes, and the day before, but you can’t have them today. 4. Stop asking the same thing over and over and over again. OK, so every now and then Rob or I will give in and let you have or do what you want once you’ve asked 500 times but that was because we were TIRED! You can’t hold this against us and hope this trick will work again. My daughter came in this morning and asked me if we could go to M&S (She calls it Marks and ‘Spensive) to buy sausage rolls. (She bloody loves sausage rolls, especially the ones that you have to take a loan out to buy at high-end shops.) I was asleep, so mumbled ‘We’ll see’. Big mistake because this was then followed by a concentrated 20 minute campaign to negotiate a solid agreement to purchase said party food. Once I had agreed I thought that meant I could go back to sleep. But no! My daughter would not let up until she had a fixed time as to when we would leave. I plucked ‘2pm’ off the top of my head, desperate to make her go away so I could go back to sleep. I then had to endure her asking ‘are you getting up now?’ every three and a half minutes for the next four hours. 5. Stop arguing with your brother/sister! Oh My God the rows my children have with each other drive me insane. This should be number one, actually. I read once that dealing with children fighting with their sibling was the equivalent of having a whole extra child. Ain’t that the truth. Here is a list of the most recent topics my children argued about. A pritt stick glue was found in the sitting room. Both claim it as there’s. This led to a physical punch up. A complete inability to keep to ‘their’ side of the two-seater sofa. Which one of them loves the dog more. I find this infuriating as not one of them does a fricking thing for the dog. They won’t walk her, feed her, water her or pick up after her unless I threaten them within an inch of their lives. Whenever my children argue, I am haunted by the words once said to me by my best friend. Like me, he has a sibling only 18 months younger than him. Unlike me, he has never got on with his sister. I have always got on with my brother, and value that relationship very much. My friend told me that one of the reasons he doesn’t have a great relationship with his sister is because when they were children his mother always took her side when they argued. She was very good at playing the victim so he ended up in trouble and bitterly resentful. So when I am faced with the red-faced fury of my children hurling abuse at each other I have to make an effort to try and listen to both sides to ensure justice and parity is in place. Rob and I constantly tell them how important our siblings are to us. We talk seriously about the friendship and camaraderie we have with our brothers. How they are an important link with our childhood. This means nothing to them. 6. FLUSH THE CHAIN. There’s few things more revolting than entering the bathroom to discover a child has already, and quite visibly, used the lavatory already. Also, use the bloody loo brush. I have demonstrated the wonders of this little instrument hundreds of times but the lesson doesn’t seem to stick. I’m not sure which child it is, but one of them does a sort of sideways poo which clings stubbornly to the bowl. Both of them adamantly deny it is them. Once I cleaned the loo, watched my son go in, watched him go out, then called him back in to witness me pointing an accusing finger at the sideways poo. He shrugged, ‘that was there when I went in – my sister is so disgusting.’ He capered back to his room whilst I stood mouthing, ‘but I just…’ with steam exploding from my ears. I’ve even toyed with the idea of getting a web cam in there to catch them red-handed, but have now seen sense. It takes a great deal of parental experience to translate daughter’s shrieks. But whatever the cause, they never fail to make my blood pressure soar through roof. Looking back at this list I have to admit that they could have been much worse. Five years ago I would have written things like ‘Stop sitting on my lap and cannoning your head back without warning, smashing my nose and front teeth so hard my eyes water,’ and ‘please don’t insist you don’t need the loo before changing your mind the minute we walk into the shop (which has no facilities) and insisting you need to do an enormous poo RIGHT NOW’. I have no doubt that in a few years time I will have a whole new host of things to moan about with my children. And yes, I know, a few years after that I will be moaning about how much I miss them. But in the meantime, maybe this list will help them to make a few tweaks so 2018 is peaceful, joyful, blessed and full of familial love. Ha! Chance would be a fine thing. They’ll learn when they have kids of their own! I’m not sure my sanity could last that long…. Great list! My two sons get along but they both fight constantly with their little sister 😫 also I feel your pain about the toilet. My 9 year old perches delicately on the front of the seat, leaving treasure that refuses to be buried! Yes! Why do they do that? !